To put 200 calories in perspective, check out this informative video. We have this image of weight gain resulting from excess, laziness and gluttony. The good news is that the opposite is also true. Weight LOSS can happen from a few simple tweaks and improvements. In most cases we don’t need a complete overhaul. But don’t worry, you don’t need to strictly count every calorie IN and OUT. 1) Cut down on fats and oils. Yes I know there is a big push for healthy fats these days, but I believe some of us have gone a little overboard. 2 tablespoons of oil = approx. 300 calories. Include a small amount of healthy fats, but know that a little goes a long way. 2) Swap a large serve of pasta, rice or bread for veggies or salad. 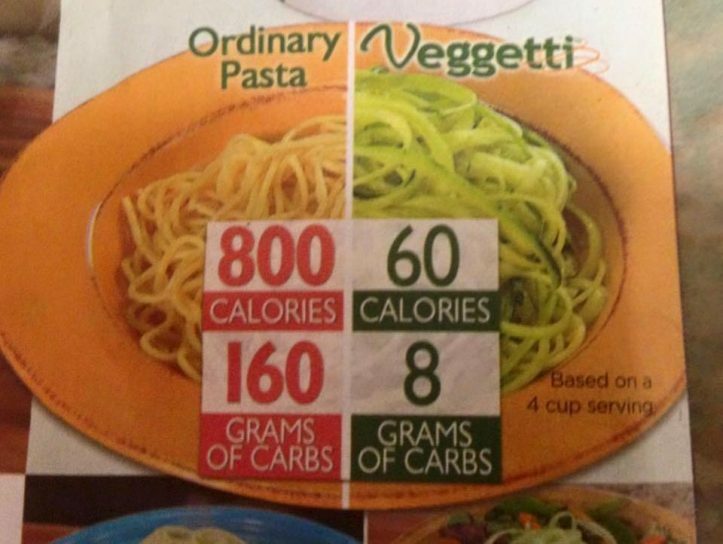 That way the size of your meal is similar, but the calorie content is much lower. 3) Have 2 low calorie fasting days per week – as in 5:2 fasting. Ensure you don’t eat MORE than you normally would on your 5 regular days, otherwise some (or all) of your benefits will be cancelled out. 5:2 fasting. Could it work for you? Its not rocket science. Less food = less calories = weight loss. 5) Reduce or omit some non-essentials. Yes you read that correctly. It takes a LOT more time to burn up an extra 300 calories than it does to reduce it. However, don’t let that put you off. This equates to an extra half hour walk twice a day. ** Make sure you don’t compensate by eating more than you normally would. Huff and puff plus use and overload your muscles. Which will give you the same weekly total as above, just split up in a different way. 10) Do a combination of INCREASING calories burnt and DECREASING calories consumed. 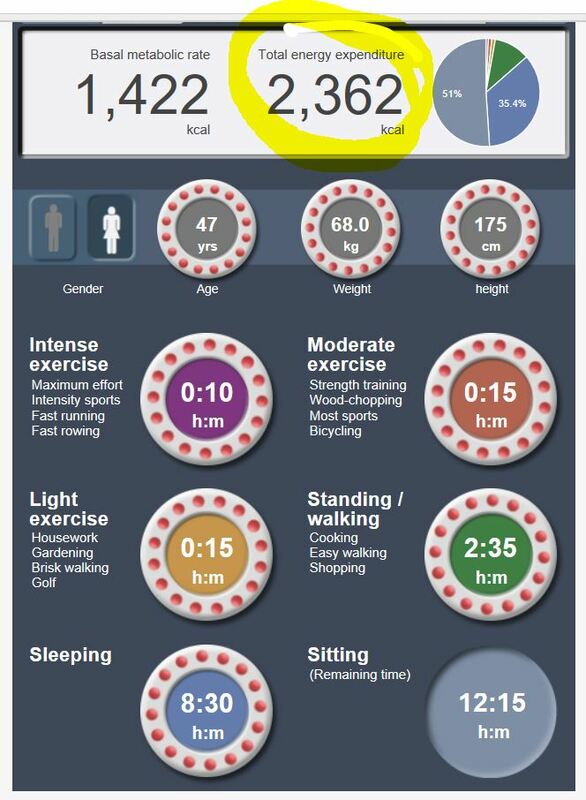 ** above numbers based on 70kg female might burn with added activity. A) Exercise gives you ADDED benefits. Whilst all of these options will achieve weight loss (over time), the exercise options give you ADDED benefits of heart and lung health, muscle gain and strength, mood, energy and so much more. B ) Please choose the easiest and least disruptive ways for you to do this. You should choose exercise sessions that GIVE you energy, confidence and willpower, not drain you. You should choose foods and meals that you enjoy and that keep you full. C) If you ever go back to your old ways, you will go back to your old weight. IE- – You only get the result whilst doing the action (like daily showering to stay clean). Seems obvious, but I see so many people who think the “job is done” once they reach their goal weight. Instead of trying to lose 10kgs, focus on BEING the person at the new lower weight. BE the person. DO the actions. HAVE the result. D) This may take up to 6 months to achieve, but don’t let that put you off. By that time these habits will run on auto-pilot and maintaining the new lower weight will be a breeze. E) Focus on your weakest link first. IE – if you have already addressed your intake, then don’t go lower, instead put more focus into burning up more calories each day and vice versa. Coming soon – – Common mistakes. Part 5) Want more proof? Try this little experiment for yourself. Go to THIS CALORIE CALCULATOR and enter your current details. The above image shows my current details. It tells me I burn approx. 2362 calories per day. I can assume that I currently consume an average of approx. 2362 cals per day in order to maintain my 68.5kg weight. Because we know that Calorie BALANCE = weight maintenance. **If you have recently lost or gained weight, you can assume you are not in a “weight maintenance” phase. We discuss this in full in my COMMON MISTAKES article. 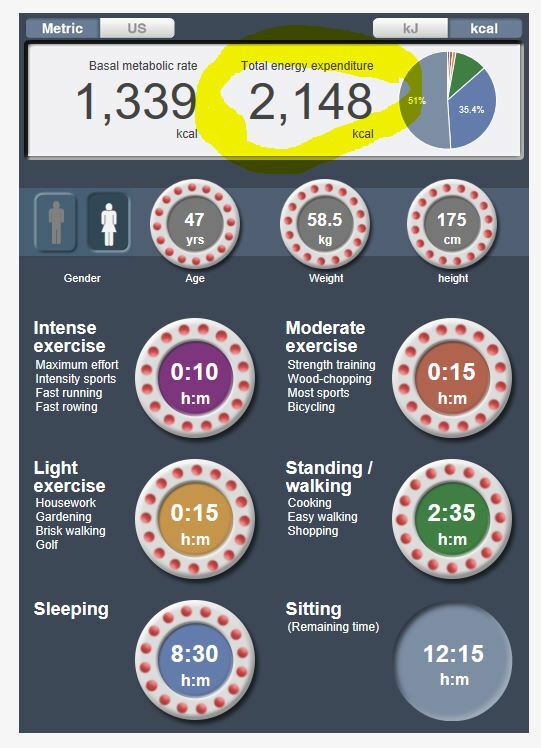 Now go to the CALORIE CALCULATOR again..
Leave all activity details the same, but change the weight section to 10kg less. As you can see, if I wanted to maintain a 58.5kg weight (10kg loss from current weight), I would need to consume approx. 220 calories less per day (every day). I love this calorie calculator because it highlights so well the fact that MOST of the calories burnt in a 24 hour period are simply to keep us alive. Then we burn some extra when we move around / exercise etc. It gives an estimate only. Every day will be a little different, so don’t get too obsessive with it all . Makes you think twice about “just a little bit wont hurt” doesn’t it? Although to clarify, a little bit extra done once in a while wont do much damage. A little bit extra done every day, quickly adds up. Want more help with your fitness and fat loss goals? 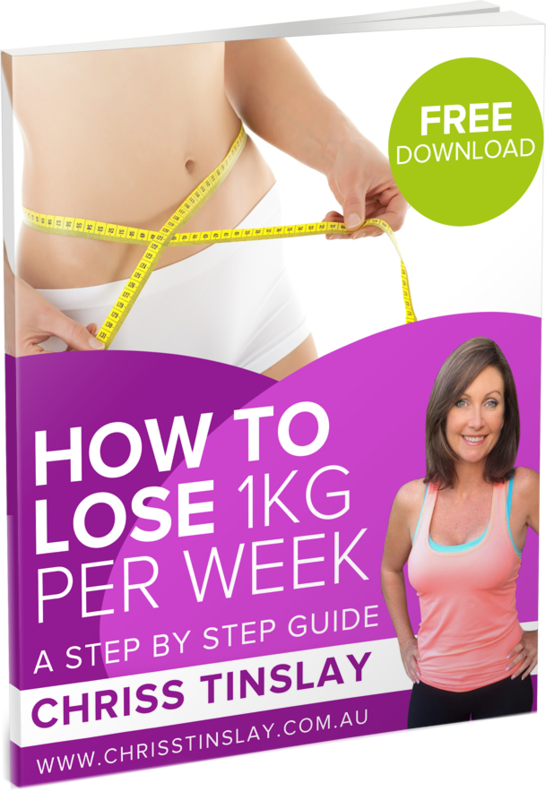 Chriss Tinslay is one of Australia’s leading fat loss experts. 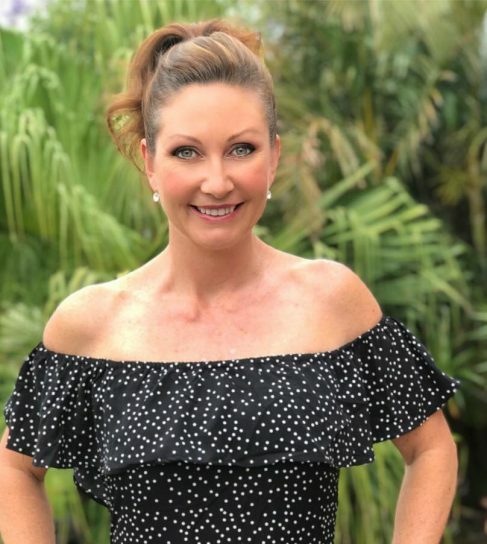 Find out how she can help you achieve your weight loss goals without strenuous exercise or giving up any of your favourite foods.